One of Kenya’s best kept secrets is its numerous golf courses. Few places in the world offer such perfect ingredients for a fantastic golf holiday, as Kenya does. The opportunity to play your favorite game, to see wildlife (sometimes on the course!) and to relax on the beautiful white sandy beaches all during the same holiday is unique. Soon after their arrival in the 1900′s British colonists began developing golf courses all over the country. They realized that Kenya had the year round climate and most beautiful settings to construct some of the world’s most desirable courses. Spend a night in Nairobi at the Windsor Golf Club. Proceed to Aberdare Country Club where you spend the day playing golf with wild life on the back ground. You will proceed to the Northern part of Kenya popularly known as Samburu and arrive in time for lunch. At 4 O’clock leave for a game drive. These 3 reserves ( Buffalo spring, Shaba and Samburu) were helped put up by Adamson’s family, they are famous for rare species of animals only found in this semi arid region. These are reticulated giraffe, grevy zebra, gerenuk, beisa oryx, and blue necked somali ostrich amongst others. After breakfast you will be taken to Mt. Kenya Safari Club. This club is located on the foot of Mt. Kenya, it is lush and boasts as having hosted many international personalities, there are various activities to be done here including bird walks, animal orphanage and golf amongst others. Spend the afternoon playing golf and a visit to the wildlife sanctuary. After breakfast Proceed to L. Nakuru National park. L. Nakuru is in the Rift Valley and is world famous as an Ornithological paradise. Sometimes up to 2 million flamingos can be seen around the lake. Other animals to be seen here include the big four (Rhino, Buffalo, Lion and Leopard). Also the rare species of giraffe known as the Rothschild amongst others. After breakfast drive to Maasai Mara National reserve to arrive in time for lunch. Maasai Mara is world famous for the annual migration of the wildebeeste. Also many National Geographical Documentaries have been recorded from this park. 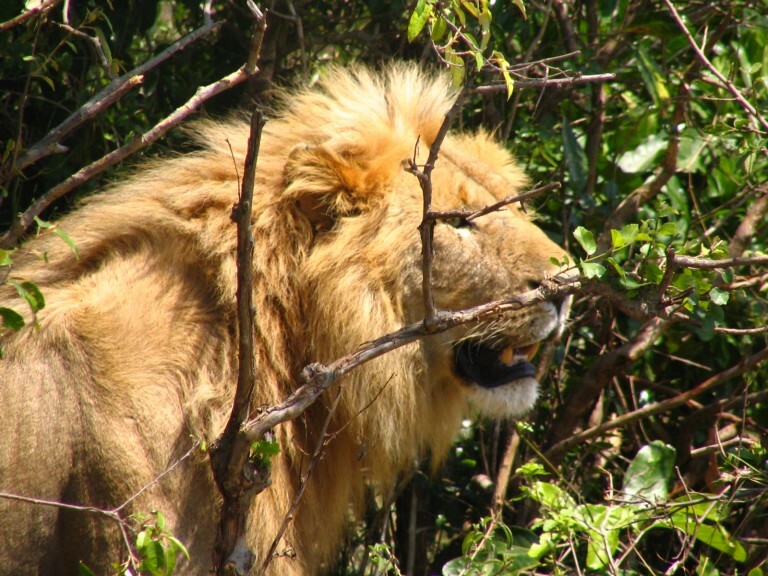 Animals to be seen here include the big five, zebras, giraffes, topi, kongoni amongst many species of wild life. Also there are over 300 species of birds to be seen. Spend the whole day game viewing. After breakfast drive to Nairobi which is arrived in time for Lunch at Windsor Golf Club. Fly back to Nairobi to connect your flight back home.